Understanding the Escrow System. It is very important that you finalize your order when you receive your package! How it works, is that when you make your purchase the money goes into escrow, meaning Silk Road is holding it. When you click the “finalize” link you are basically saying that you got the package and the vendor should get paid. This is a safety measure. If your package does not arrive, the Silk Road staff will come in and moderate. They will take into account your reputation and the vendors reputation as well as other things. A common judgement is for the vendor to refund half the money. While things like this do happen, it is in the minority. If you are dealing with an established vendor with a reputation, they do not want to tarnish their reputation by scamming a bunch of people who will then leave bad feedback and complain about them on the forums. Not only does it take time to build a reputation, but vendor accounts cost $500 which prevents scammers from making new accounts, scamming people and repeating the process. It is very important to finalize and release the escrow when your package arrives. It is best to do this right away as it is only fair to the vendor who is waiting to get paid. The vendor may refuse to deal with you again if you are late in finalizing and he may even report you to other vendors. The escrow is auto-released after 21 days. If it is auto-released it will show up on your stats page and other vendors may refuse to deal with you if they see that you do not finalize. Once you have finalized, that’s it! The transaction is finished. 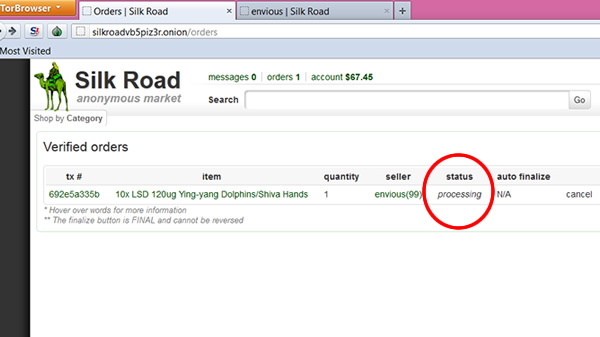 Congratulations, you have made your first Silk Road purchase!